Inspired by Restless Jo I’ve decided to share a favourite walk of Le Chic family this week. Jo has had the wonderful idea of sharing her passion for walking by not only writing a weekly post “Jo’s Monday Walks” on her own blog but asking for contributions from bloggers around the world. The result is a weekly collection of a wide variety of walks that span different continents, countries, towns, cities, wilderness areas – a truly eclectic mix! 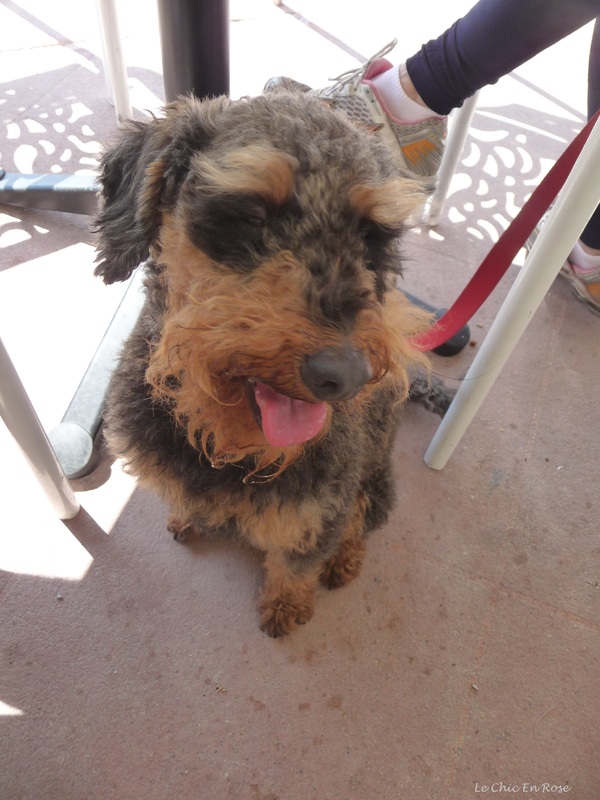 Now I’m aware that as dog owners we are supposed to be the pack leaders but Winston Le Schnoodle, our exuberant 4 year old schnauzer/poodle cross has been rather over indulged (I won’t say by who) and as a result likes to set his own agenda for walking. He has his preferences and this is one of his current favourites. It does involve a 5 minute drive from home and Winston is not a car lover but he cheers up when we arrive at our destination. 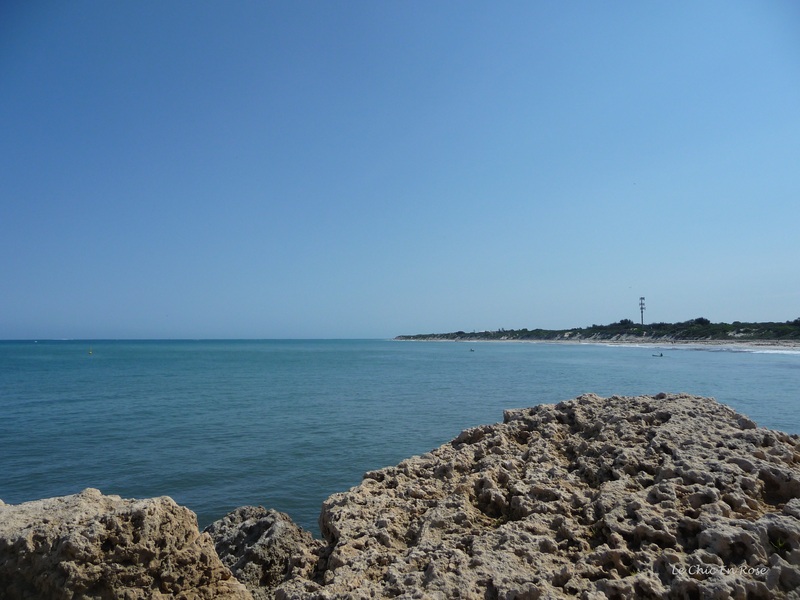 Tourists and locals alike often head up the coast, about a 20 minute drive from the Perth city centre, to Hillarys Boat Harbour (also referred to as Hillarys Marina or Sorrento Quay). It’s a man-made marina and boardwalk complex which has become one of Perth’s most popular recreational destinations. There is a safe beach area popular with families, countless cafes, restaurants, a myriad of shops (selling clothing, souvenirs and fishing gear amongst other things) and a number of attractions such as The Great Escape (featuring a giant water slide), Harley Davidson tours, and AQWA (the Aquarium Of Western Australia). Visit hillarysboatharbour.com.au for further information. Sadly for Winston, however, dogs are not permitted in most of the complex. This may not be a bad thing as quite frankly it is often packed and teeming with people especially at weekends and public holidays. However if you walk or drive round to the north side of the Quay, which will only take you a few minutes, you find yourself out on the breakwater with glorious views in every direction and a welcome feeling of space. We begin our walk in the car park at the end of Northside Drive in the Spinnakers Cafe car park (more of that later). 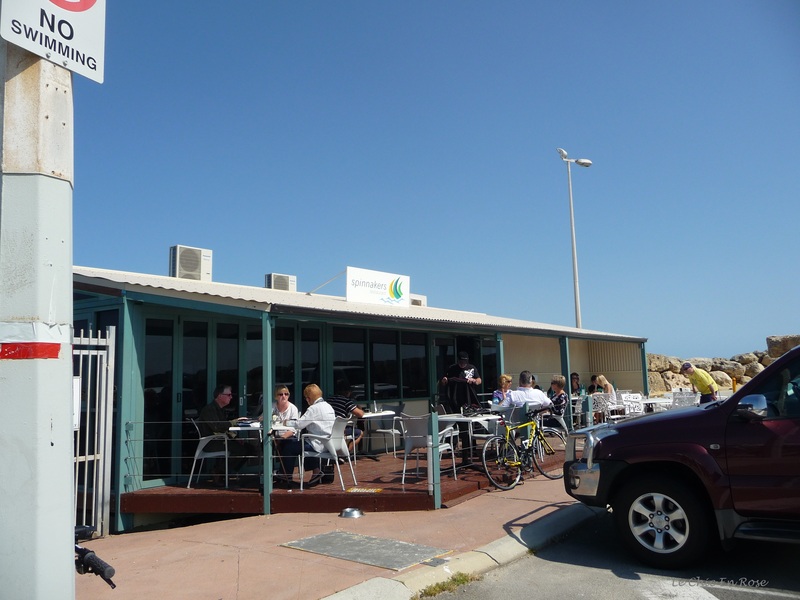 Our initial route takes us along the breakwater past the Hillarys Yacht Club, Naturaliste Marine Discovery Centre, Perth Diving Academy and Dive Shop on one side and the turquoise waters of the Indian Ocean on the other. 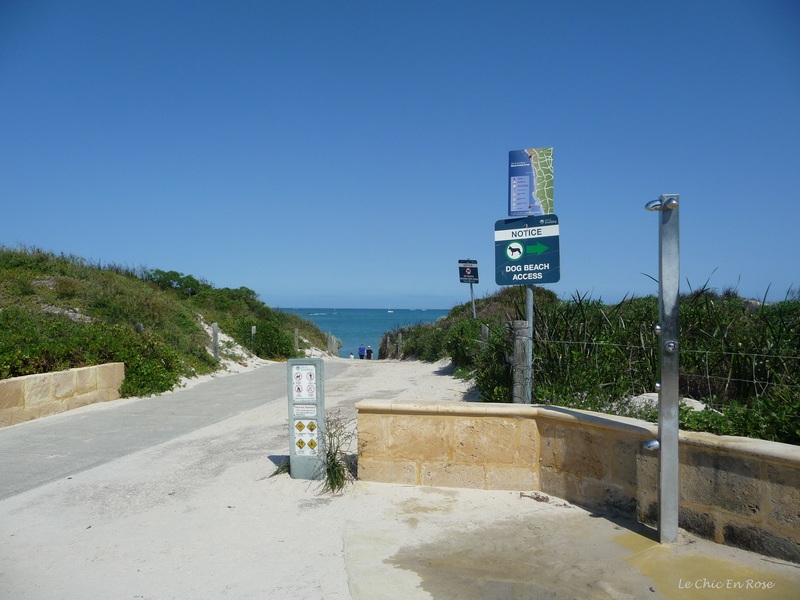 From here we turn due north and join up with the coastal walking and cycling path, which extends from South Fremantle up to Burns Beach in the north. Should you wish to walk or cycle the path in its entirety the distance is just over 50 kilometres. 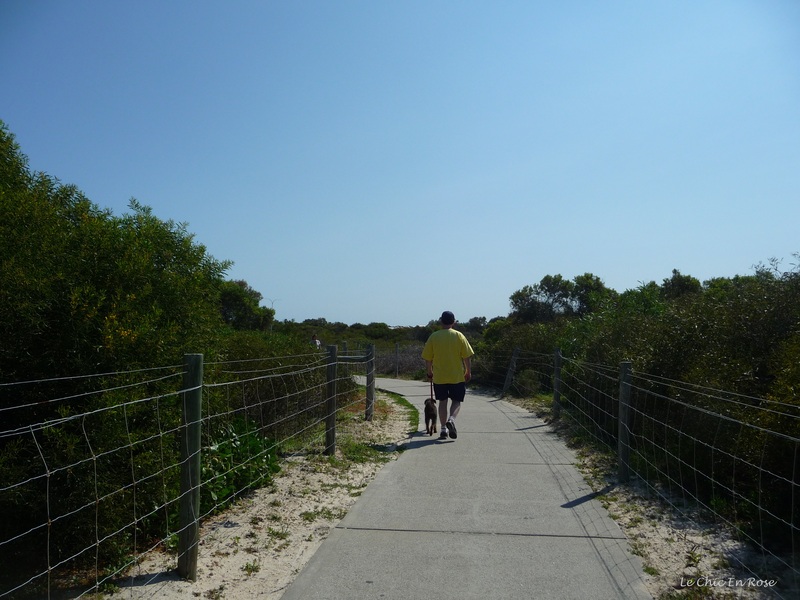 The native bushland has been preserved and incorporated into the Hillarys Beach Park, which provides a range of recreational and picnic facilities. It’s a safe walking area well away from the road though you do need to be mindful of passing cyclists especially if you have an easily excited dog! We come to a turning leading down to the beach but alas dogs are not permitted there! Pathway down to Hillarys Beach dog free zone! Winston doesn’t seem too perturbed and after a quick drink we set off again. A few minutes further along we reach the designated dog beach zone where dogs are permitted to exercise off-leash after midday Monday to Saturday and all day Sunday. I was also interested to read on the City Of Joondalup website, joondalup.wa.gov.au, that the beach is also used as a horse beach exercise area, which is presumably why there are certain restrictions involving dogs. Horses are allowed at the northern end and dogs at the southern point. Although this freedom is seen by many dogs as a chance to frolic in the waves, Winston is not a water-loving schnoodle (he hates getting wet!) so after a few minutes of sniffing around (Winston that is!) we retrace our steps all the way back to the car park. Here you have a superb view of the marina complex. Whilst not quite Monaco or St Tropez there are a large number of boats moored here, which would not look out of place on the Cote D’Azur itself. 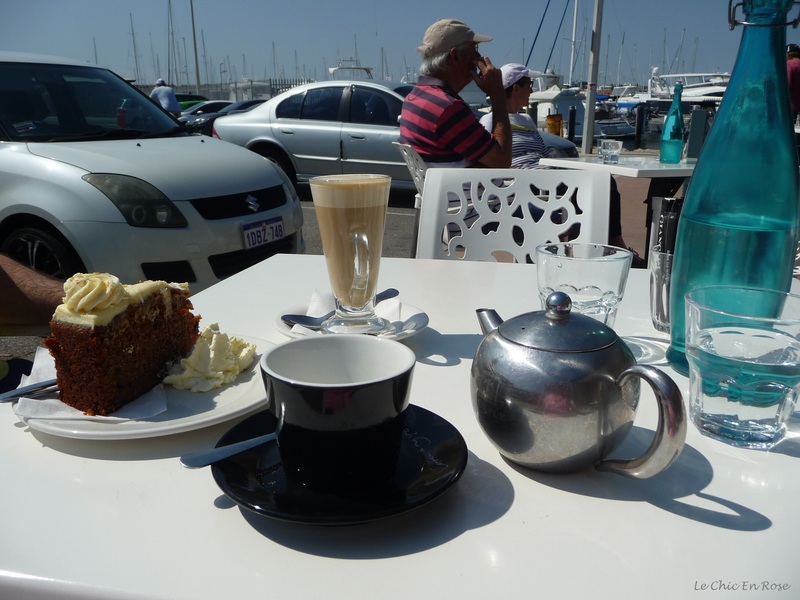 All that exercise has left us needing refreshments and we always enjoy morning coffee, or lunch or both on the veranda of Spinnakers Cafe (95 Northside Drive Hillarys). Whilst there is a gorgeous view over the water from inside the cafe, as we have Winston with us we must sit outside but unless it happens to be raining this is no bother at all. 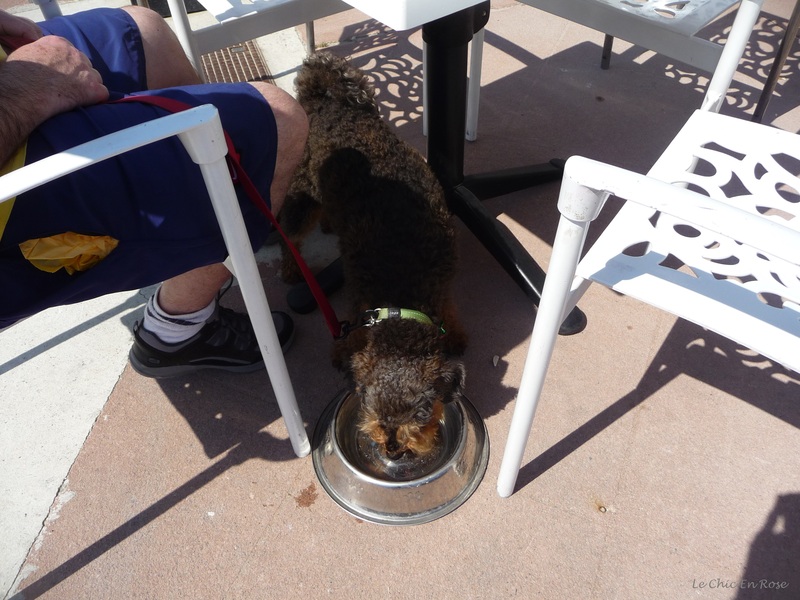 Winston enjoys it as he is well catered for…. And Monsieur Le Chic and I are partial to the house carrot cake…. Did you spot the feral cat? You’ll have to click on the photo of the breakwater to see it peeping out from the rocks. There are many such cats living wild down by the sea presumably runaways or abandoned cats and their offspring. Although I’m sure they get by on the fishermen’s cast offs, it always makes me feel rather sad for them especially when I think of La Duchesse, our extremely pampered feline back home who would no doubt be quite horrified by feline living conditions at the breakwater! Finally we must leave and make our way home – some of us for a long rest! Winston Le Schnoodle thinks it’s time for a rest! Winston clearly knows a good walk Rosemary – this looks gorgeous, beautiful scenery and a great cafe at the end, what more could you ask for! A slice of that carrot cake at the end of a good walk would be just the thing. Lovely to see blue skies and sunshine as well since we seem to have passed that stage here now. (Winston is also a bit of a cutie!). I had to laugh about Winston. I’m the owner of a beagle who thinks she runs the show … hmm … actually does run the show. And she enjoys cafes. And beaches. And long rests after taking us for walks. The beach looks beautiful. And warm. Thanks we are indeed fortunate here there are a couple of dog beaches near our home so dogs can run around to their heart’s content! Am glad you love Perth – I believe you live on the other side of the continent? We lived in Melbourne for 7 years and used the opportunity to travel around the eastern states. I liked Sydney but don’t think I could live there! The NSW coast is beautiful we went to Mollymook near Ulladulla once for a short break and that was lovely! I love walking and I love sea… in your post you just showed a perfect combination of both 🙂 Would be nice to walk there! ← Getting to Grips With the Lingua Franca Swiss Style!